Slice of Pi Quilts: Detour Quilt - Stash Statement Book Hop! 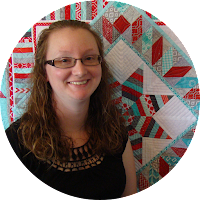 I looked through all the quilts in the book and decided to choose the Detour quilt. I was drawn to the warm colors Kelly used, and wanted to make one in a completely different palette! Normally, I'm not a scrap quilt person. Random colors and prints are too much for me. So I wanted to use a simple palette to bring cohesiveness to all the scraps. Of course when I'm unsure about what color to start with - I default to aqua! Which led to a snag - I didn't have hardly any aqua scraps! I used up nearly all of my fabric scraps when making the Quilts from the Ashes quilts in December. 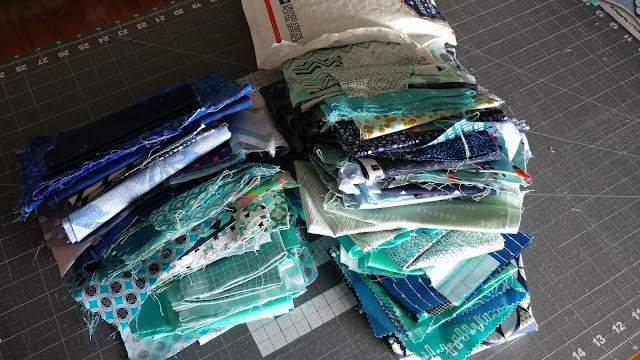 My best quilty friend, Heather, generously sent me a stuffed flat rate envelope of her aqua and blue scraps for me to use! Quilty friends are the best!! 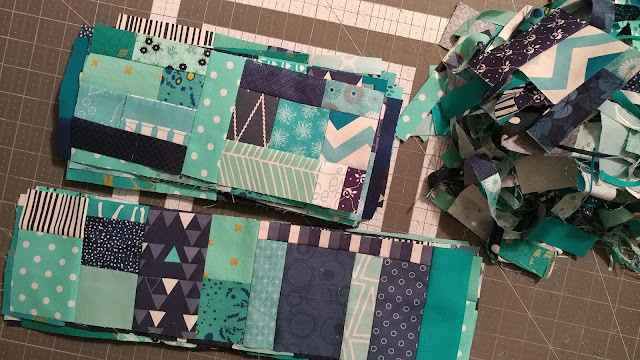 In the book, Kelly first walks you through how to use your scraps and leftovers to build new usable sizes of fabric. I admit, I was super scared to start! The improv idea really intimidated me. I am a *bit* of a perfectionist and prefer precise measurements. But I decided to trust the process, and surprisingly, it was much easier than I expected! 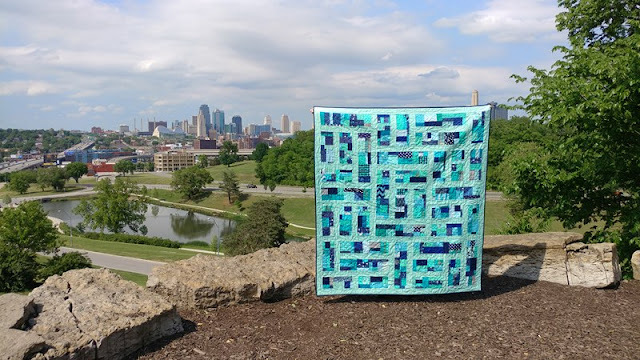 Once all my fabric panels were made, I had to decide on a sashing color. My first thought was Moda Bella white (because I always have a bolt or two on hand! ), but I was nervous that white was too much of a contrast with the blocks (did I mention scrappy is hard for me??). When visiting my local quilt shop, they just happened to have a bolt of Moda Bella solid in aqua. I bought a few yards because - aqua. I was quite happy with how it looked with the blocks! It did blend in quite a bit, but that helped my brain accept the scrappiness. 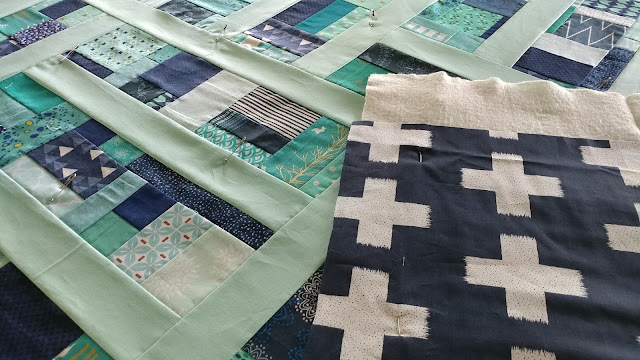 I pin basted the quilt with Warm & Natural batting and a blue and white plus fabric by Art Gallery Fabrics that I found at another local quilt shop. 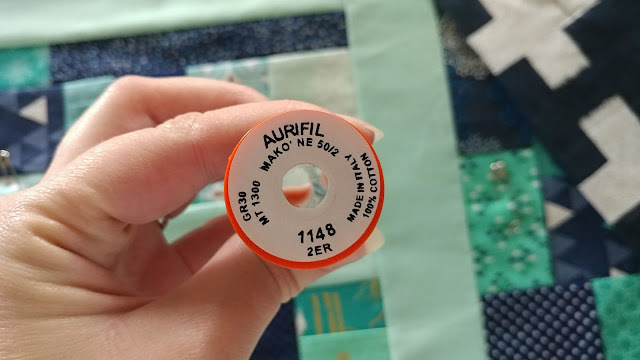 I chose 50wt Aurifil #1148 Light Jade for the quilting. 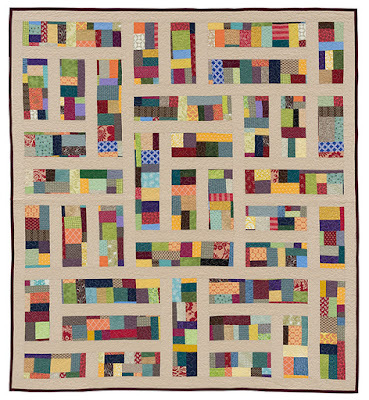 I used the free motion quilting foot on my Juki TL-2010Q to quilt a medium sized stipple/meander over the entire quilt. 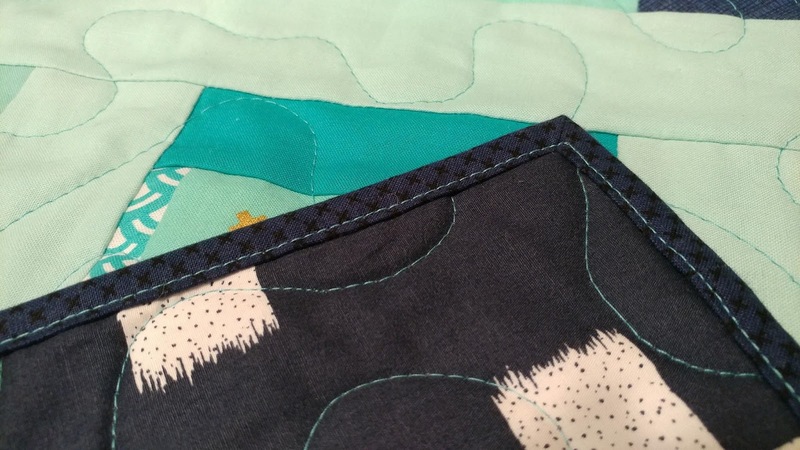 When choosing binding, I really wanted to use navy to contrast with the sashing and frame the quilt. 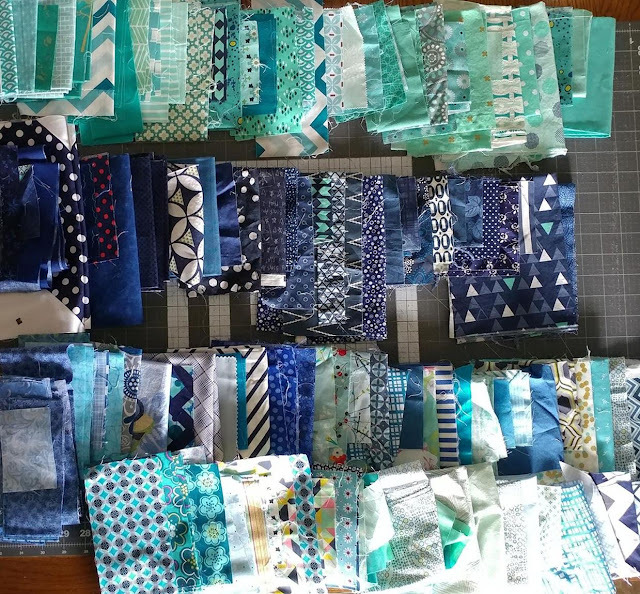 From all the fabric in my stash, I didn't have enough yardage of any navy! I tried other colors, but just wasn't satisfied. 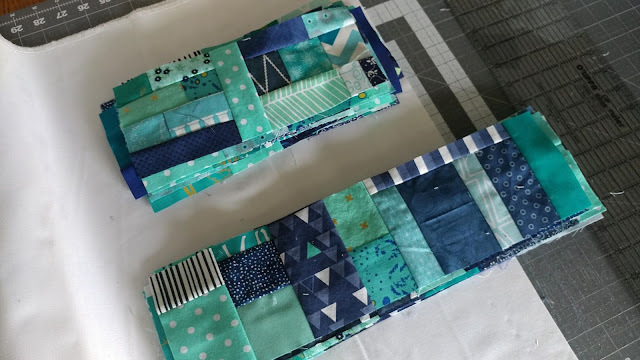 Finally, I decided to choose the largest navy piece I had and cut the binding strips at just 2". 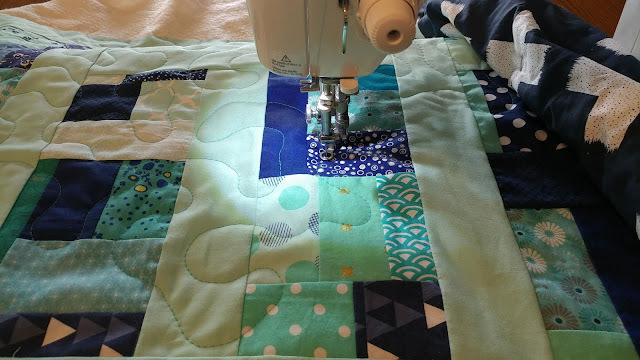 I thought I might have to hand bind the quilt in order to make it work, but with careful pressing and stitching, I was successful in machine binding the whole thing! 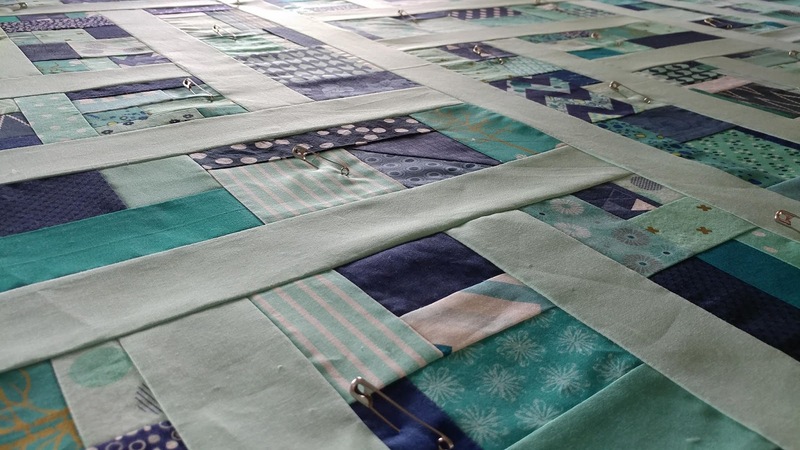 I used to use 2 1/2" binding strips, but I've recently switched to always using 2 1/4". Now that I know 2" is possible, I just might do it more often! It is a bit tricky, but there is less excess fabric on the back. Although I was nervous and hesitant about the improv construction and scrappy look, I am SO happy with the final quilt! I love trying new things, and this process was exactly that. I will definitely use Kelly's method for scrap-busting again! 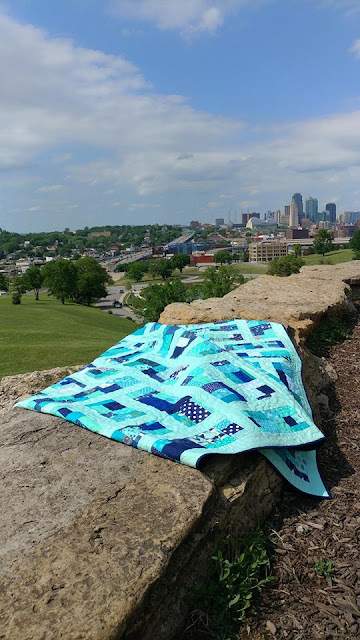 Please check out all the amazing quilts and projects the other bloggers have made from Kelly's book! There are still several weeks of projects yet to come! Be sure to follow Kelly's blog so you don't miss any of them! 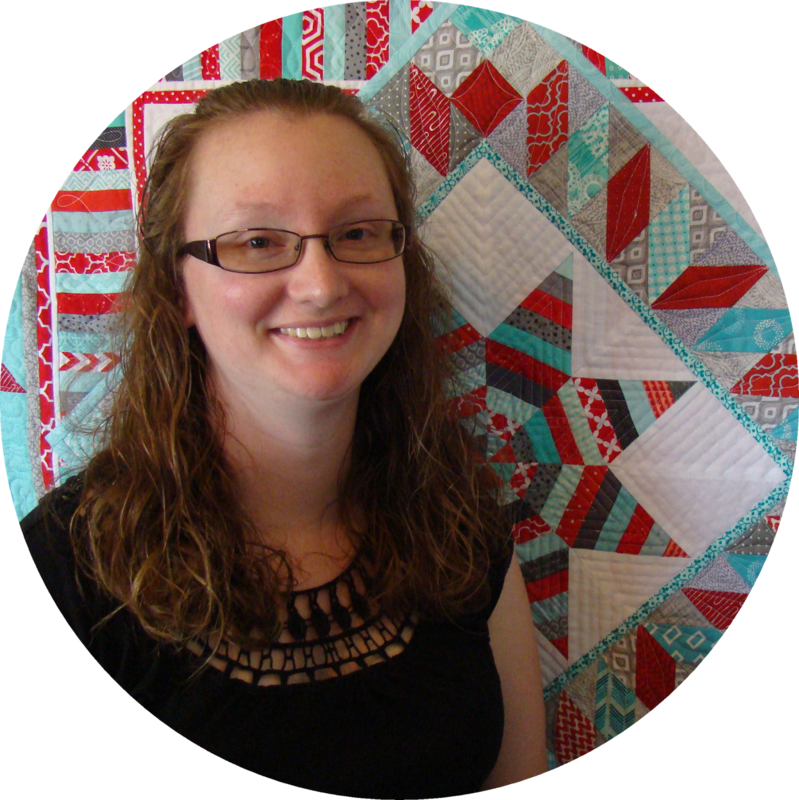 Laura at Slice of Pi Quilts <---That's me! 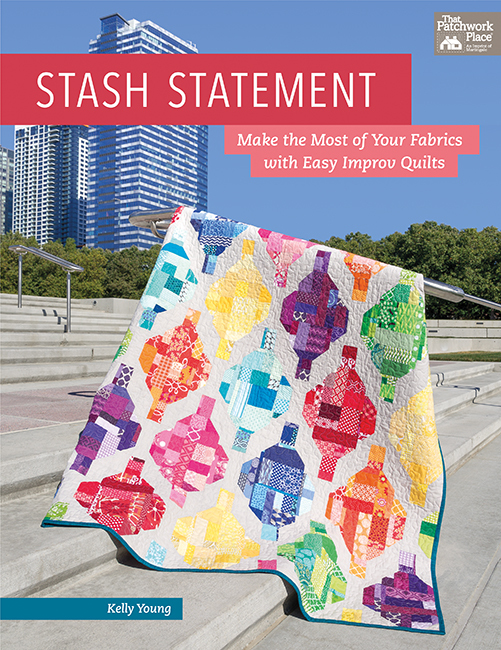 Be sure to get your own copy of Stash Statement! 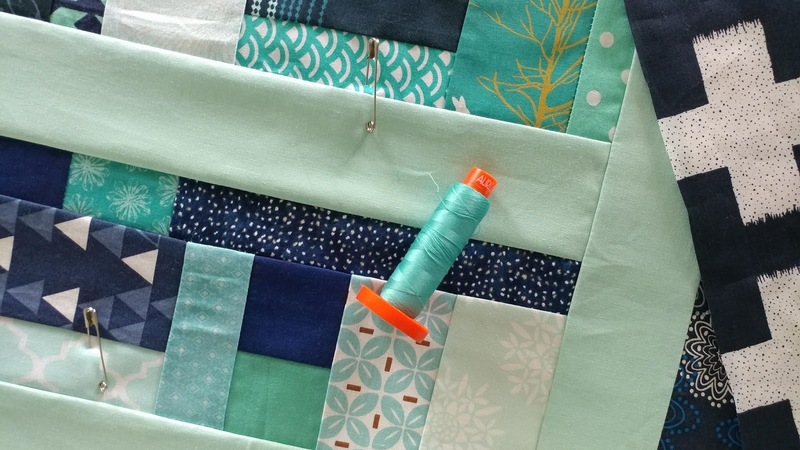 It will have you sewing up your scraps in no time! The book is available directly from Kelly (autographed and a bonus pattern too! 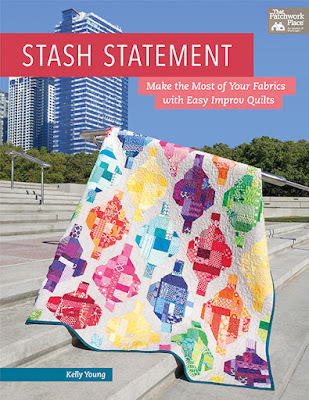 ), at Barnes & Noble, on Amazon, at Martingale, and likely even at your local quilt shop! You have done a wonderful job on this! I love your color scheme. I love it!! It looks beautiful!! 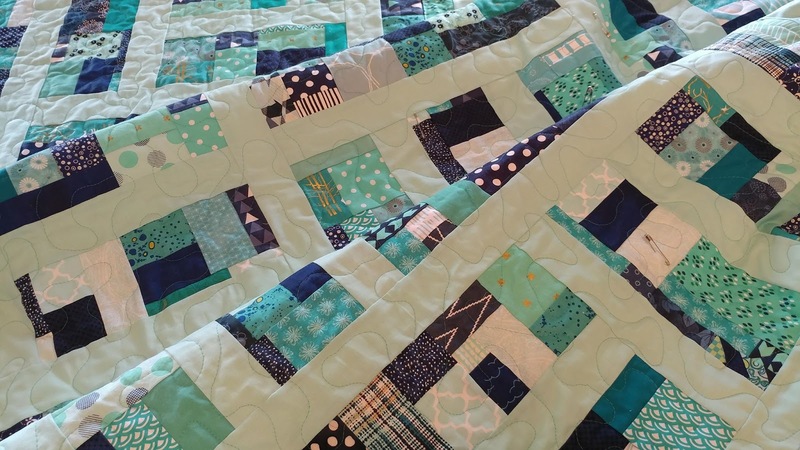 It turned out beautiful, you are a pro with scraps! 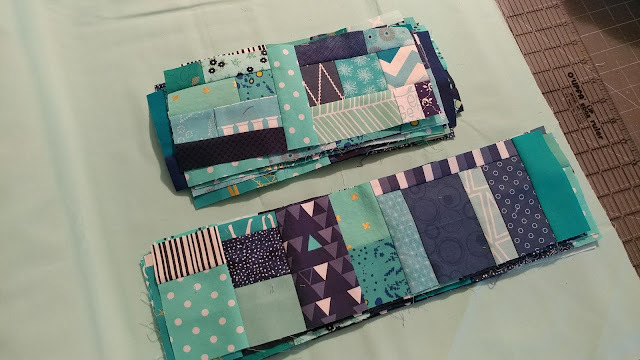 I also attach my bindings completely by machine, but I stitch on the back of the quilt first, then bring the binding to the front.. and, you're right, 2 1/2" can be a little too wide. That's what I've been using but am trying smaller sizes to see if they will work for me. 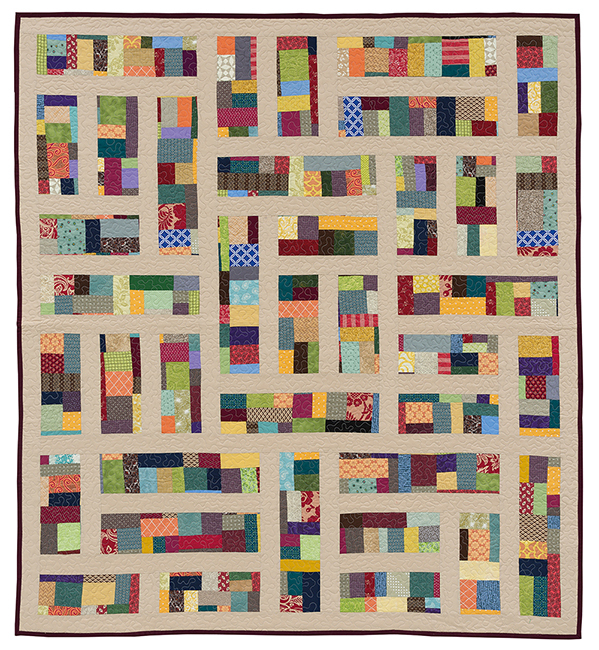 I love all the blues in your quilt and I think you did a great job 'stepping out of the box'. Love your aqua and blue version. Your quilt is just stunning, Laura! I'm so happy you enjoyed the process (it really is easier than it appears! ), and so happy you love the result. Thank you again for helping me launch my book by participating in the blog tour. It's beautiful! I love that you picked both a colored background and foreground. The monochromatic look is fabulous! What a gorgeous finish, Laura! I agree that Kelly's method for improv is a really great introduction and it's a great way to use up the stash. I love the aqua you selected for the background. Do you have any plans for the quilt? Its funny, I feel very much the same way about improv but this series is really tempting me! Great use of the scraps and a wonderful background fabric. Yes, a 2" binding is possible, but I love the 2 1/2 for its ease! Another great finish! I love your aqua and blue color palette,Laura! It's great your friend shared her scraps.I have made scrappy quilts before but never had tried improv. It was a little hard to get started. It was a fun project quilt to make in the end. A beautiful finish. I, too, think about the contrast with white backing (and the dirt it can collect just by osmosis) and have been trying other colors. I think I'm going to have buy this book because I've loved every one of the projects thus far. Thank you for sharing your fears and concerns....Sometimes I'm paralyzed by that fear and find it hard to start a project. Gorgeous color choices! I love the aqua background too. My first instinct is always a white or black or grey, but the aqua here makes it so bright and pretty! 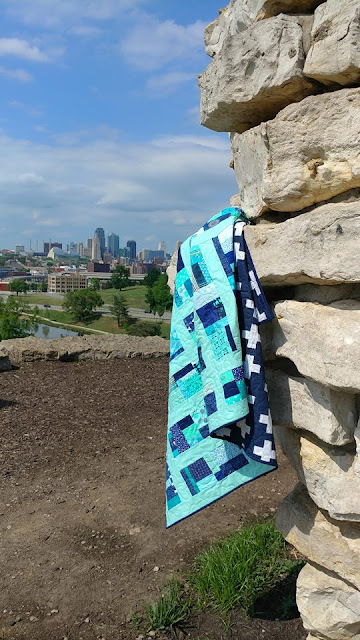 I like to plan a quilt as much as possible so improv is not really something my brain embraces either.Your quilt has turned out great! I loved the colors and photos. Absolutely lovely. I, too, like aqua/teal. 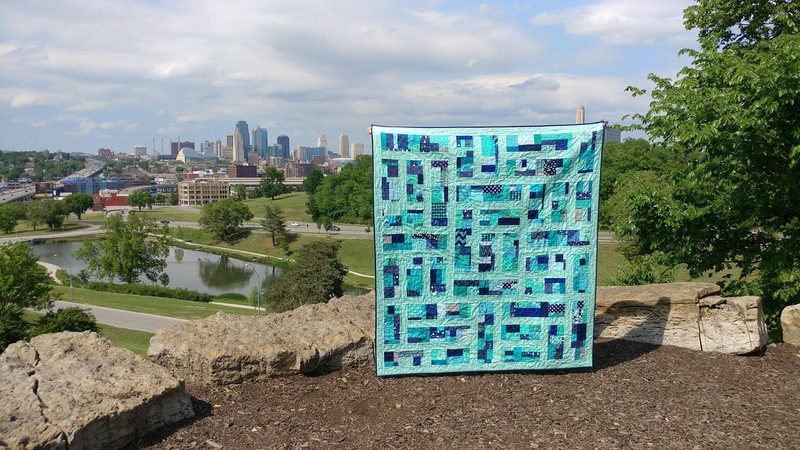 This quilt is beautiful!!! I always enjoy seeing what you've been making and how you make it. You get so much done!!! Obviously you don't need much sleep. I can’t even tell you how much I love this! It’s so very pretty and soothing!! I'm not a scrap person either but I love this. One wouldn't guess it was created with scraps. It's gorgeous. This is great. Good call on the aqua background. This is really wonderful, and a nice contrast to all those things we usually like to do. I feel like that aqua background really makes the quilt.